Have you ever looked at something and wondered, “How did that get there? !” Has that something ever been a planetary nebula? Astronomers are scratching their heads over four planetary nebulae that have turned up in the unlikeliest of locations: globular clusters. We know of thousands of planetary nebulae in the Milky Way and can even study planetary nebulae in other galaxies. So the first question is: why shouldn’t we see them in globular clusters? To understand this, we need to know a little bit more about how planetary nebulae are formed. Planetary nebulae (PNe, singular PN) form during a fleeting phase in the life cycle of low- and intermediate-mass stars (a good range to remember is 0.8 to 8 times the mass of the Sun; our Sun is likely to become a PN in ~5 billion years). PNe consist of a central white dwarf wreathed in shells of hot diffuse gas ejected during the asymptotic giant branch phase late in the star’s evolution. The gas is ionized by ultraviolet photons from the central star, giving rise to some of the most colorful and beautiful objects in the Universe (see Figure 1). 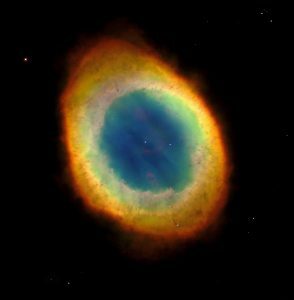 The term “planetary nebula” is an unfortunate misnomer; an overzealous William Herschel, fresh from his discovery of Uranus in 1781, thought the fuzzy greenish object he spied through a telescope bore a striking resemblance to his recent planetary find. Figure 1. M57, otherwise known as the Ring Nebula, is an elliptical planetary nebula that can be observed even with a small telescope. Image: NASA/HST. In order to create a visible PN, the central star must become hot enough to produce ultraviolet photons to ionize the nebula before it drifts away from the central star and dissipates. Stars with masses less than ~0.8 solar masses are thought not to form visible PNe because by the time the central star becomes hot enough to ionize the nebula, the nebular material has already dispersed. Given the age of the globular clusters investigated in the work (11.6 – 13.2 billion years) and stellar evolution models, stars in these clusters with masses of ~0.8 solar masses should be departing the main sequence. In other words, the turn-off mass is approximately equal to the lower limit for PN formation. If the stars departing the main sequence in globular clusters aren’t massive enough to form PNe, how did the PNe we observe come to be? The leading theories for how we might be able to see PNe in globular clusters involve interactions between two stars. First, the observed PNe might be the descendants of blue stragglers—main sequence stars with masses higher than the cluster turn-off mass which are thought to be the result of two stars merging. The resultant PN would appear to be the evolutionary product of a single massive star, but the PN central star would be more massive than a typical white dwarf in the cluster. Alternatively, the PNe could result from post-common-envelope binaries. (You can learn more about post-common-envelope binaries and how they relate to PNe here.) The common envelope accelerates the star’s transition between asymptotic giant branch star and white dwarf. As a result, the PN central star can have a mass equal to or less than the typical cluster white dwarf mass. In this paper, the authors analyzed Hubble Space Telescope observations of the four known globular cluster PNe in order to determine the most likely formation scenario for these objects. Optical images of the four target objects can be seen in Figure 2. 1. Two PNe (first and third in Figure 2) most likely resulted from a merger or mass transfer. However, the masses cannot yet be determined precisely enough to distinguish between the formation scenarios described above. 2. One PN (far right in Figure 2) shows only weak evidence for a binary interaction. If PNe in globular clusters arise from single stars, it would require a re-evaluation of established evolutionary timescales. 3. The last object (second from the left in Figure 2) is so bizarre that the authors questioned its membership to the PN class altogether! With only half of the known four globular cluster PNe requiring some form of binary interaction, we can’t yet invoke binaries as the cause of globular cluster PNe. Despite this, it’s still important to understand the role that binary and multiple star systems play in PN formation because so many stars in the Galaxy fall into the PN progenitor mass range. Do binary systems help shape many PN? Or can single stars put on a spectacular end-of-the-line display without assistance from a companion? Earthlings, five billion years from now, will be waiting to find out.